I found this moth while wandering around an urban environment- not exactly the wildlife I was expecting to see! I tend to have ambivalent feelings about insects- love the dung beetles, not so much the termites. I’m also a creature of the day- sun’s up and I’m ready to go, sun’s down and I’m ready for bed. As a result, while I spend a good chunk of time paying attention to the butterflies I see, I’m not nearly as aware of the moths. As luck would have it, now is a perfect time for me to try correcting that ignorance- not only are the nights warm and welcoming, but July celebrates National Moth Week (the 23rd through the 31st), a now-global operation whose goal is to help people become more aware of and citizen scientists for moth conservation. Check out their website for information on events near you and ways to submit moth sightings! In the meantime, I’ll be looking into the state of moth populations and moth conservation around the world. 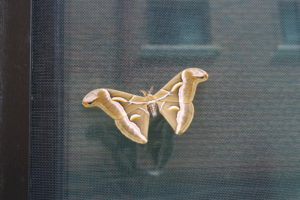 My knowledge about moths is pretty basic- apart from generally recognizing them as nighttime counterparts of butterflies, which means that they probably face many of the same pesticide and habitat loss issues, I’m really not sure if their populations are doing well or if they have special challenges. The learning curve is bound to be pretty steep here, and I’ll pass along what I find. Hopefully you’ll do the same with any moths you encounter!